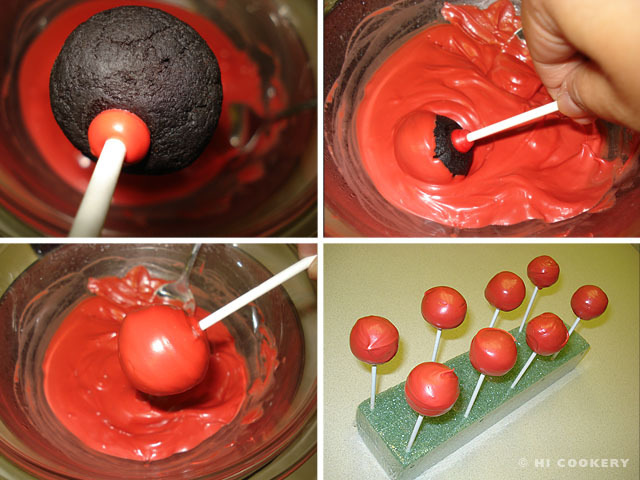 Have a helluva Happy Halloween with these tempting treats: devil cake pops! When we leveled off the tops of our devil’s food cakes, we literally decided to make delicious little devils, complete with an impish smile, fondant horns and a red hot nose! 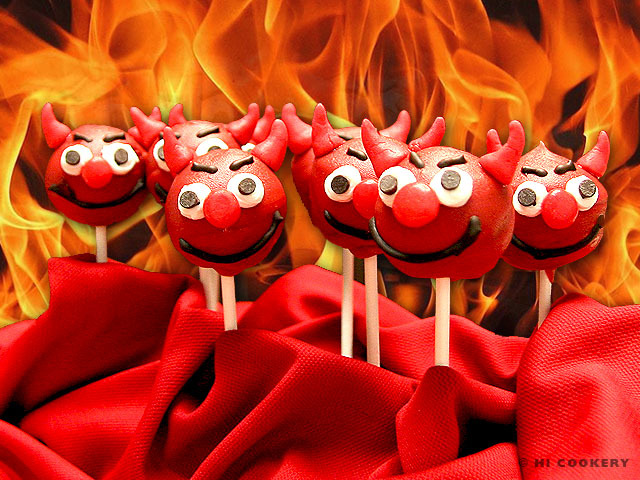 So fire up those creative culinary skills and make devil cake pops–they are sure to be the hot stuff on a Halloween table! Bake and cool the cake. Break into fine crumbs. 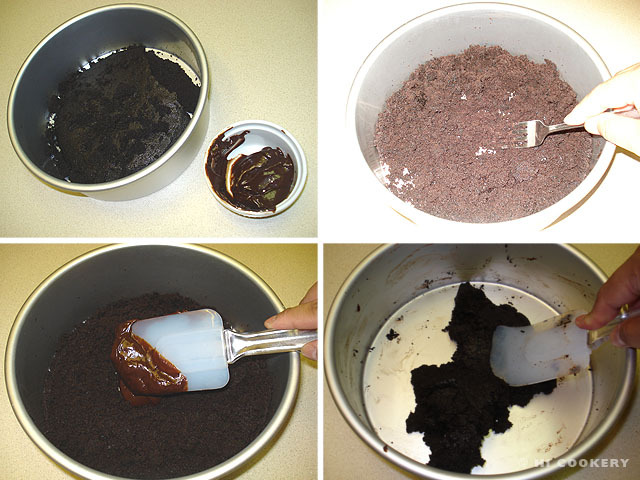 Moisten with the chocolate frosting to make a mixture that has a sticky yet smooth texture. Scoop or pinch out 1 – 1 ½ inch of the mixture and roll into balls. Place on a flat plate or cookie sheet (preferably lined with wax paper). Refrigerate for about 15 minutes to firm them up. Microwave the candy melts in a small bowl according to the package directions. Stir until smooth. Set the bowl over a pot of simmering water to keep it tempered. Dip the end of a lollipop stick into the melted candy. Insert it at least halfway into the cake ball. Refrigerate again to set the candy and secure the lollipop stick in place. 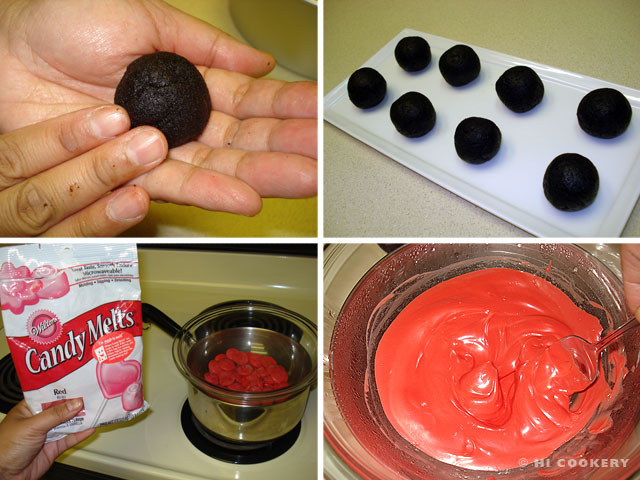 Dip the chilled cake balls into the melted candy, working quickly to cover the surface. Allow the excess to drip back into the melted candy bowl. Stick into a styrofoam block in the refrigerator. Cool to set the candy coating. Pinch out a small amount of red fondant and knead until pliable. Roll into a tiny ball, form into a cone and shape into a horn. Make enough pairs for all the cake pops. 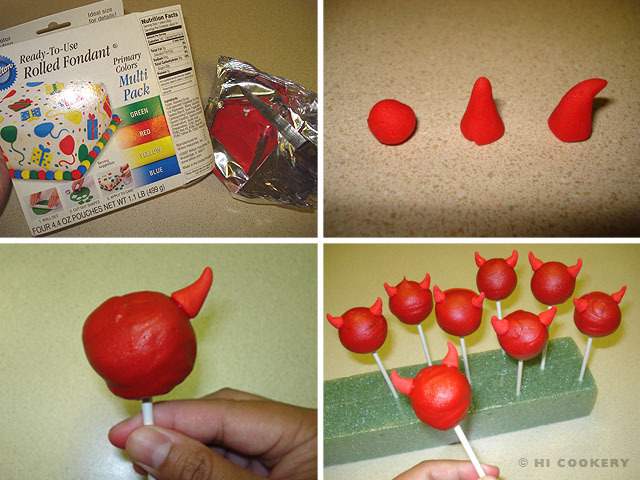 Use a dot of red tube frosting to attach the horns to the cake pop. Refrigerate to set. Pipe in the eyes with white tube frosting. Add a mini chocolate chip for the eyeballs. Pipe the eyebrows and mouth with chocolate or black tube frosting. 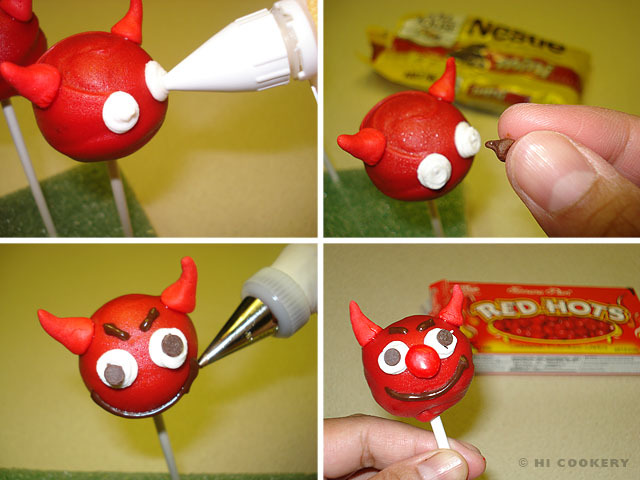 Use a dot of red tube frosting to attach a cinnamon candy for the nose. Refrigerate until ready to serve. Display on a decorated styrofoam block or cake/lollipop stand. For more fun and freaky foods on Halloween, prepare pumpkin cake pops. Search our blog for other creatively creepy Halloween recipes. I don’t know if it is appropriate but these are so cute !!! I’m even tempted to make some cake pops. The first picture is really cool !!! How many cake pops does this recipe make?